The simple answer would be a soldier who fights on horseback while wearing armor, but there’s much more to being a knight. Who were the first knights? 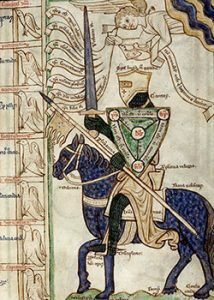 There have been soldiers on horseback for thousands of years, but what we think of as medieval knights first came into being during the time of King Charlemagne (Charles the Great). Charlemagne was a Frank (Frenchman). His knights kept him safe in battle and won him many victories. Chanson de Roland (Song of Roland) was written about Charlemagne’s most famous knight. Whom did knights work for? Knights fought for their lords who in turn fought for their king. The king might take on a task as a favor for another king or in obedience to the Pope. A knight would typically give 40 days of service each year to his liege lord. What did a knight get paid? Charlemagne’s knights were given grants of conquered land which quickly put them on the road to wealth. They might also receive gifts of money or other precious things. However, some knights weren’t paid at all. The answer is not knighties. Helmet: a metal covering for the head. These developed from small to huge. Plate armor: used by the Greeks and Romans early on, but it didn’t come back into fashion again until the 13th century. The fanciest types of plate armor completely covered the knight and had reticulated (jointed) elbows and knees. Greaves: armor that protects the leg. Half-greaves only protect the lower leg. Again, these could be made from fabric, leather, or metal. Parade armor: not designed so much for combat, parade armor was meant to impress the ladies--and your fellow knights. Did knights go to knight school? Page: Boys as young as seven would begin work as pages in a castle. 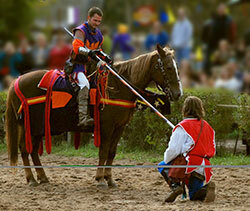 In addition to working, they would learn archery, horsemanship, and sword-fighting. Squire: A page would become a squire and assist a particular knight around age 10 to 14. This included muscle work (cleaning stables, polishing armor, keeping weapons ready) and brain work (learning the codes of knightly conduct and stories about famous knights) besides more combat practice. Knight: At about the age of 21, squires might make their vows of allegiance to their liege lord. In the early days, these ceremonies were fairly simple, but they became more elaborate during the times of the Crusades. Could anyone be a knight? No! (and yes!) Noblemen’s sons were the ones destined to take the slots for pages in the castles. Exceptions might be made, but on the whole, it was a matter of who your father’s and mother’s friends were. But the King could knight anyone he wished, and families that rose in rank this way were said to have been ennobled. Did every knight have his own castle? No. Castles were expensive. Poorer knights might live in a castle owned by their lord or in a nearby manor house. By living this way, they would be ready to go to war or protect their lord’s lands at a moment’s notice. Could knights read and write? Not always. Some could; some couldn’t. It wasn’t a job requirement. Those who could read often enjoyed reading stories about famous knights as well as philosophy and religious books. A vow is a sacred promise that must not be broken. 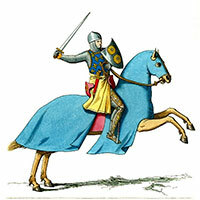 In knightly stories, a knight might make a vow to complete a quest (a mission, usually dangerous) for his lady or lord. In real life, vows would be made to serve their lords and be faithful to their loves. The word chivalry comes from the French word chevalier, which means knight. Chivalry was much written of in the Middle Ages, and it was a code of conduct that included brave acts in battle. Many of these military rules came from the old Romans. Chivalry also came to mean being kind to women and poorer people. Eleanor of Aquitaine, who was both a French and an English queen, encouraged her musicians (troubadours) to sing stories of chivalry at her court. She was especially fond of stories of King Arthur and tried to model her court after his legendary one. Why is the date 1066 important? When the Romans invaded in 43 A.D., Britain was made of a bunch of tribal kingdoms. The Romans brought a centralized government to much of the island, as they had done with all of their territories. After the Romans left in 410 to deal with their own problems (the Roman Empire officially fell around 476), their legacy faded. The British invited the Angles and the Saxons (Germanic tribes) in to help them fight off the Danes. The newcomers stayed, asked their friends to come over, and eventually ruled most of Britain. In 1066, William the Conqueror came over from Normandy and took the throne after the famous Battle of Hastings. His sons and grandsons would become the English kings. They brought the French traditions of knighthood along with them. 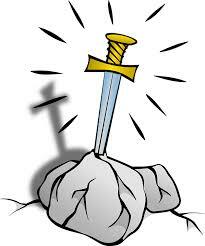 A crusade is a holy war fought by Christians. 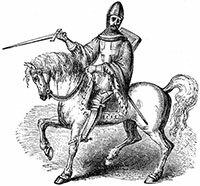 In the Middle Ages, there were several official crusades (1095-1291) that brought knights from all over Christendom (most of Europe) to the Holy Land to take back Jerusalem from Muslim rule. Later crusades were to protect Anatolia, part of the Byzantine Empire, from Muslim invasion. The stories of Robin Hood and Ivanhoe are set at the times of the crusades. Who was he really? In the 400s and 500s, after the Roman Legions left Britain, the island was beset by many marauding invaders. This time is often called the Dark Ages. King Arthur is generally believed to have been a knight or a king who still carried on the Roman military traditions. The real King Arthur is thought to be mentioned - though not by name - in an old story about the Battle of Mons Badonicus (Mount Badon) which took place against the Anglo-Saxons about 500 A.D. Were there any women knights? As a rule, no. As an exception, yes. Tales have been told through the ages and the world of women disguising themselves as men to save cities and kingdoms. In China, there was Mulan. In Catalonia (Spain) in 1149, there was the Order of the Hatchet which honored the women who fought off the Moors from their town of Tortosa. Dressed in men’s clothing for their deeds, they earned the title of knight and had special privileges thereafter. Joan of Arc put on armor to save France in Guilelmus Peraldusthe 1400s, but she was never officially made a knight. 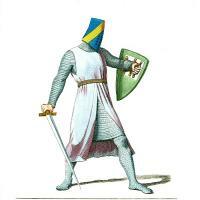 Check out knightly facts and stories in our booklist, Knights in Shining Armor. Ask your teacher if a report on one of these terrific knightly tales could get you a little extra credit. Four cousins take a magical trip back in time when a miniature knight comes to life. Growing up in Dark Ages Britain, young Arthur learns not only jousting, hunting, and swordplay but also how to be a gentleman and how to see the world from many angles, thanks to the wisdom of his wizard tutor Merlin. Thirteen-year-old Martin's first day as page and squire to Baron Eric of Less Mortain is also his last when the Baron mysteriously disappears and his visiting distant relative and heir, the moody Sir Basil, takes charge of the castle. Fourteen-year-old Terence was not looking to become a squire to Gawain of Orkney, but when he joins the young knight on a quest, he learns important things about himself. Runs August, September, and October. Check their site for details, including specific dates. You’ll see jugglers, archers, magicians, aerialists, jousters, jesters, a kids’ sing-along, pyrates, children’s theatre, and more. Children may also be knighted! Enjoy watching jousting and while feasting year round as guests of “the Castle.” This bit of the Renaissance runs indoors all year long at Arundel Mills Mall in Maryland. Matinees and educational programs are available. Running weekends from most of May to the beginning of June at Lake Anna Winery in Spotsylvania County.